This tutorial shows how to mirror a Kafka broker in a Kafka enabled event hub using Kafka MirrorMaker. One major consideration for modern cloud scale apps is the ability to update, improve, and change infrastructure without interrupting service. This tutorial shows how a Kafka-enabled event hub and Kafka MirrorMaker can integrate an existing Kafka pipeline into Azure by "mirroring" the Kafka input stream in the Event Hubs service. An Azure Event Hubs Kafka endpoint enables you to connect to Azure Event Hubs using the Kafka protocol (that is, Kafka clients). By making minimal changes to a Kafka application, you can connect to Azure Event Hubs and enjoy the benefits of the Azure ecosystem. Kafka enabled Event Hubs currently supports Kafka versions 1.0 and later. Read through the Event Hubs for Apache Kafka article. An Azure subscription. If you do not have one, create a free account before you begin. On Ubuntu, run apt-get install default-jdk to install the JDK. Be sure to set the JAVA_HOME environment variable to point to the folder where the JDK is installed. On Ubuntu, you can run apt-get install maven to install Maven. On Ubuntu, you can run sudo apt-get install git to install Git. An Event Hubs namespace is required to send and receive from any Event Hubs service. See Creating a Kafka enabled Event Hub for instructions on getting an Event Hubs Kafka endpoint. Make sure to copy the Event Hubs connection string for later use. Use the Kafka quickstart guide to set up a cluster with the desired settings (or use an existing Kafka cluster). Kafka MirrorMaker enables the "mirroring" of a stream. Given source and destination Kafka clusters, MirrorMaker ensures any messages sent to the source cluster are received by both the source and destination clusters. This example shows how to mirror a source Kafka cluster with a destination Kafka-enabled event hub. This scenario can be used to send data from an existing Kafka pipeline to Event Hubs without interrupting the flow of data. 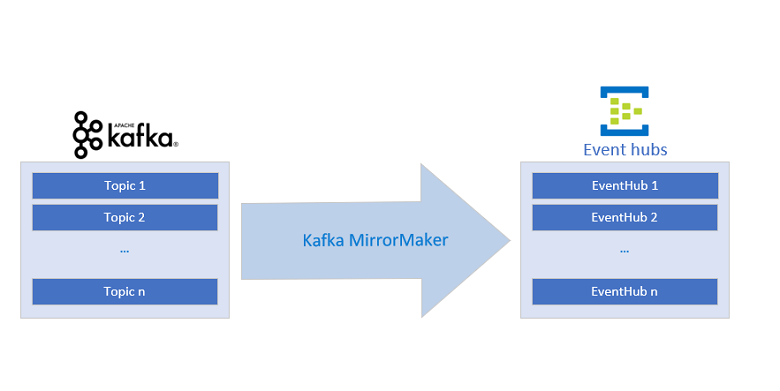 For more detailed information on Kafka MirrorMaker, see the Kafka Mirroring/MirrorMaker guide. To configure Kafka MirrorMaker, give it a Kafka cluster as its consumer/source and a Kafka-enabled event hub as its producer/destination. Update the consumer configuration file source-kafka.config, which tells MirrorMaker the properties of the source Kafka cluster. Run the Kafka MirrorMaker script from the root Kafka directory using the newly updated configuration files. Make sure to either copy the config files to the root Kafka directory, or update their paths in the following command. bin/kafka-mirror-maker.sh --consumer.config source-kafka.config --num.streams 1 --producer.config mirror-eventhub.config --whitelist=". *"
To verify that events are reaching the Kafka-enabled event hub, see the ingress statistics in the Azure portal, or run a consumer against the event hub. With MirrorMaker running, any events sent to the source Kafka cluster are received by both the Kafka cluster and the mirrored Kafka enabled event hub service. By using MirrorMaker and an Event Hubs Kafka endpoint, you can migrate an existing Kafka pipeline to the managed Azure Event Hubs service without changing the existing cluster or interrupting any ongoing data flow.